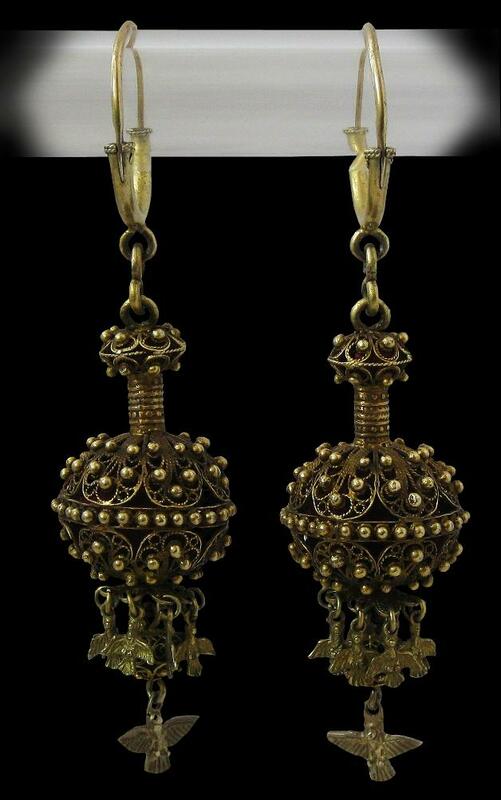 These elaborate silver-gilt filigree earrings are from La Alberca, a village in the Sierra de Francia region of Spain’s western province of Salamanca. Similar earrings have been found in nearby La Maragatería region of Leon province. They comprise a large hoop beneath which are suspended the filigree and applied granulate hollow spheres with an interior post lined with red velvet. Suspended from each main sphere are seven smaller bird like appendages and one larger one. 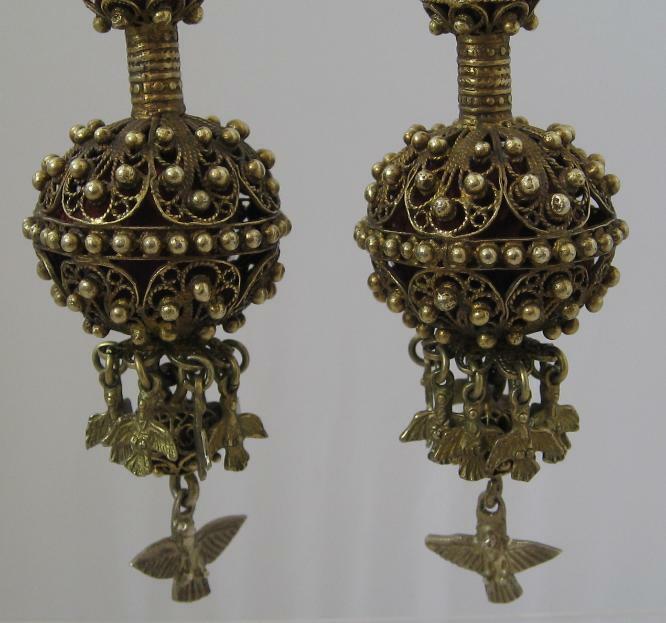 These either represent doves or have a talismanic purpose. A less elaborate and incomplete pair is illustrated in Museo del Pueblo Espanol (1984, p. 60) – the collection of the Museo del Pueblo Espanol was incorporated into Spain’s National Museum of Anthropology in 1993. The Sierra de Francia and La Maragatería regions are mountainous and it is believed that small Jewish communities were able to hide and prosper in the areas on account of the difficult terrain. 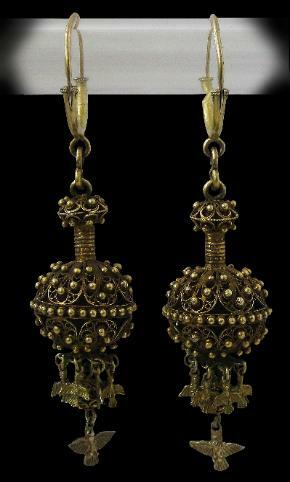 Locals believe this accounts for the styling of their jewellery, which is suggestive of north African and Middle Eastern Islamic jewellery – work often carried out by localised Jewish silver and goldsmiths. 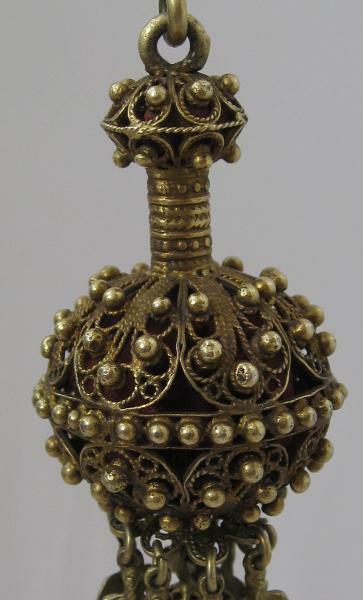 According to literature published by the Hispanic Society of America, the villagers of the regions believe their traditional wedding jewellery to be of Arabic origin. Jewellery of this type relates very well to jewellery in former Spanish colonies, such as the Philippines. 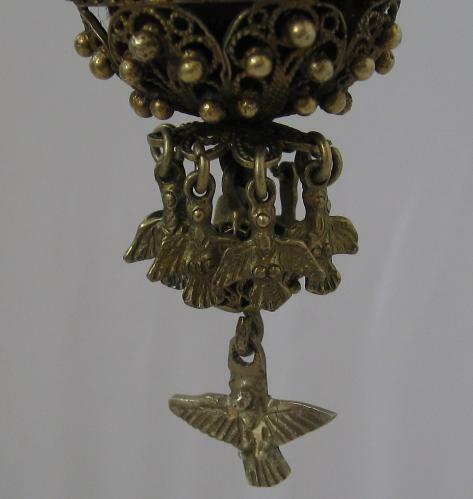 The earrings are provided with a display stand. The earrings are stable and wearable. Joyas Populares, Museo del Pueblo Espanol, December 1984; ‘Jewelery, Necklaces – La Alberca, Salamanca’, a pamphlet published by The Hispanic Society of America, 1931.